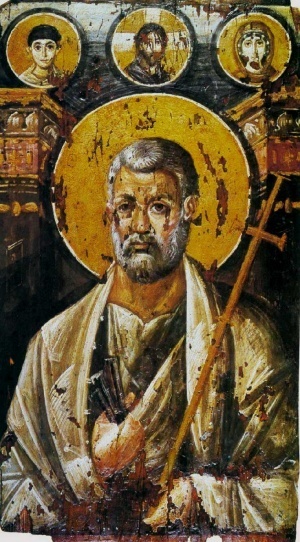 St. Peter, 6th-century encaustic icon from St. Catherine's Monastery, Mount Sinai. The holy, glorious and all-laudable Apostle Peter is the leader of the twelve apostles of Jesus Christ. His feast is celebrated on June 29 along with the Apostle Paul. On being raised by the Lord to the dignity of an Apostle and becoming inseparable from him as his zealous disciple, he followed him from the beginning of his preaching of salvation up until the very Passion, when, in the court of Caiaphas the high priest, he denied Him thrice because of his fear of the Jews and of the danger at hand. But again, after many bitter tears, he received complete forgiveness of his transgression. After the Resurrection of Christ and the descent of the Holy Spirit, he preached in Judea, Antioch, and certain parts of Asia, and finally came to Rome, where he was crucified upside down by Nero, and thus he ascended to the eternal habitations about the year 66 or 68, leaving two Catholic (General) Epistles to the Church of Christ, known as I Peter and II Peter. He is also generally regarded as being the primary source (i.e., in interview) for the material recorded in the Gospel of Mark. This page was last edited on July 19, 2016, at 23:05. This page has been accessed 70,968 times.